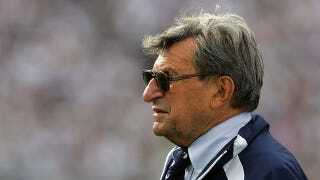 In 1987, the L.A. Times ran a lengthy, largely laudatory feature on Joe Paterno. Considering certain recent revelations, there are a couple quotes that are awfully intriguing. "It's unbelievable to think that kind of corruption came right from the top of the power structure. The NCAA did what it had to do." "We have raped a generation-and-a-half of young black athletes. We have taken kids and sold them on bouncing a ball and running with the football and that being able to do certain things athletically was going to be an end in itself. "We cannot afford to do that to another generation."